Virna first appears 40 minutes into the film but it's well worth waiting for her. She looked stunning in this typically ribald Italian comedy. 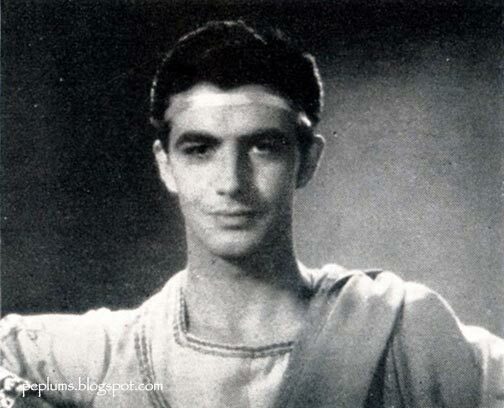 Screen Tests : Robert Taylor + Audrey in QUO VADIS? 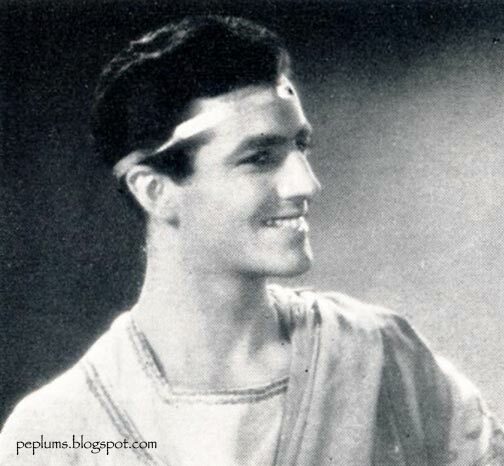 This is a screen test with a very young Robert Taylor (aka Spangler Arlington Brugh...what a name!) 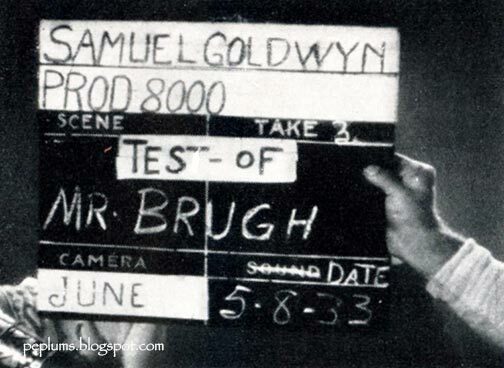 made back in 1933 for Samuel Goldwyn. It wasn't for any specific film, they simply dressed him up in Roman clothes. An unimpressed Goldwyn told Taylor to "Go home and fatten up." Taylor replied something like "I'd like to but I don't have any money to buy a decent meal." 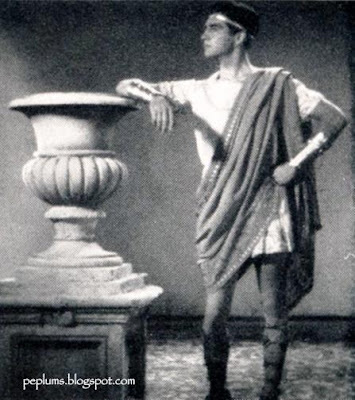 This would be a precursor of sorts for his role in QUO VADIS (1951). Who knew back in 1933 that 18 years later Robert would star in that blockbuster. Amazing stuff. 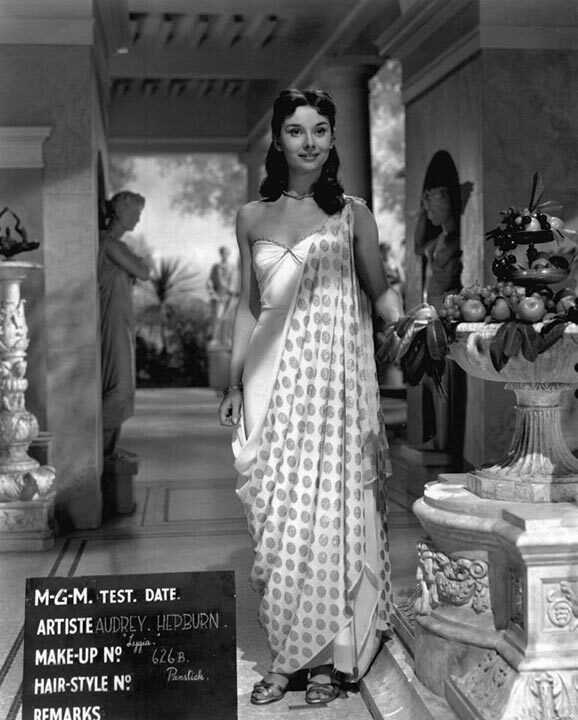 Did you know that Audrey Hepburn did a screen test for the Deborah Kerr role in QUO VADIS. Audrey might not have been the correct actress but she would have been more interesting than Elizabeth Taylor who also did a screen test, as seen here. This photo shows how Audrey was made for the PEPLUM genre. She had something regal about her that was perfect for the genre. Unfortunately she only made a few such films, like WAR & PEACE. Even if you've already seen HERCULES UNCHAINED several times before this might be the first time you finally get to see this super brief scene as it was shot, which is hard to come by. In the full screen version available in North America, the heads are cropped off so you don't see who's who. In the widescreen copy from the German DVD that I've been playing on PEPLUM TV, it is cut entirely. This screenshot is from the Italian DVD I recently got and it's not in full widescreen but it's better than nothing. I always thought this moment was way too short and it felt a bit rushed. 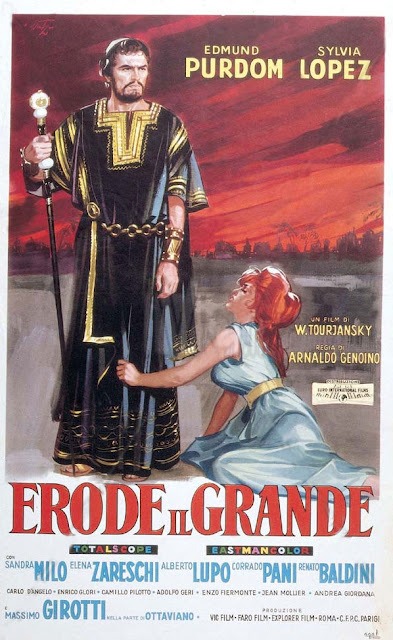 Gianfranco Gasparri made only 3 PEPLUM films, all starring Brad Harris. 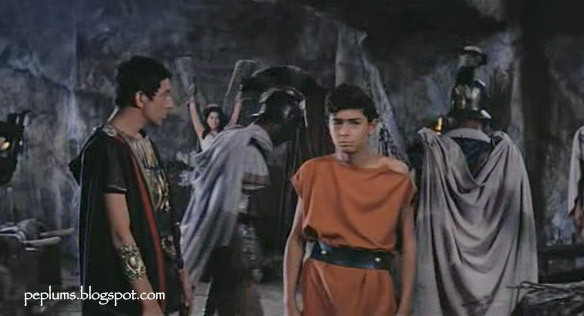 His first film was GOLIATH AND THE GIANTS (above) when he was around 12 years old and much smaller than Brad Harris. 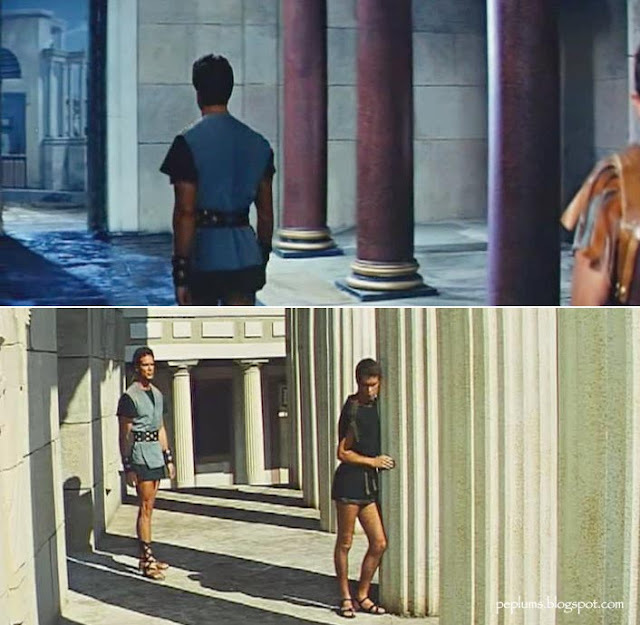 By the time he appeared in SAMSON and finally in FURY OF HERCULES (last two photos), Gianfranco was almost as tall as Brad. He changed his name to Franco Gasparri but his film career was short lived. He died in 1999 at the age of 50. When he appeared in his last PEPLUM, FURY OF HERCULES (above and below), the young Gasparri was quickly becoming a young man. 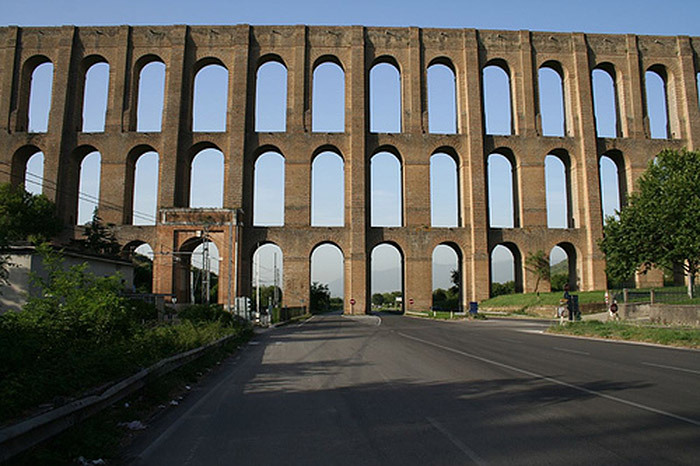 Roman aqueducts are among the greatest achievements in the ancient world. Where would civilization be without them? Quote from another blog: "The importance of the ancient Roman aqueducts cannot be emphasised enough. 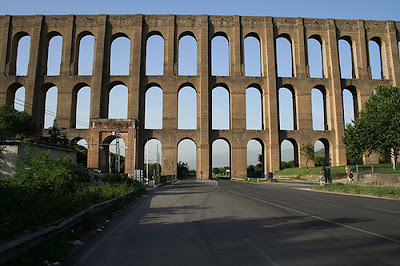 The final destruction Rome occurred in 537 AD during a siege on Rome by the Goths. The aqueducts which supplied Rome with water were destroyed. The people of Rome could not survive without water and the population of Rome fell by 90%." 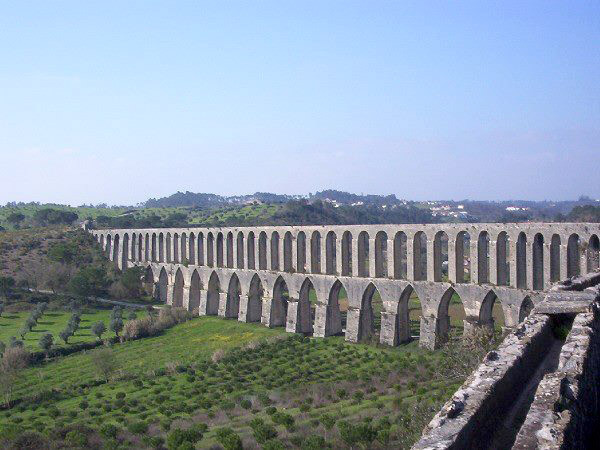 Roman aqueducts can be found not only in Italy but almost everywhere in Europe, like Spain and Portugal. 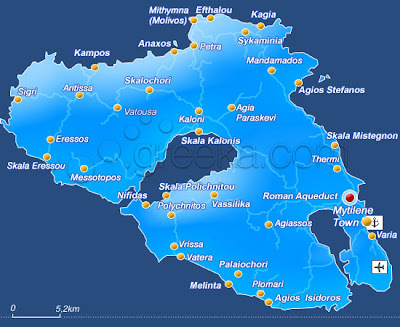 Even Greek islands like Lesbos. 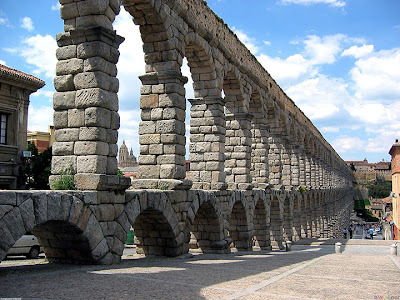 The story of a couple PEPLUM films revolved around aquaducts, including PONTIUS PILATE. A fun Swashbuckler starring the mostly forgotten Burt Nelson, who appeared in several PEPLUM films, including REVOLT OF THE SLAVES. Wandisa is a PEPLUM star so there's no introduction needed. This is one good looking film. Because it's not a Sword & Sandal film with the usual locations, the locations in this film, filmed across the Italian countryside, are breathtaking. The costumes are great as well. The red and black coat Burt is wearing in the image above is great. I want it! I recently got a hold of several cool titles (copies), with a few more on the way. The first interesting title is GODDESS OF LOVE with English subs. Yeah! I already have this film but only in Italian. The copy I got is more murky than the pristine DVD version in my collection but it has subtitles in English. I'll create a "Fan Sub": I'll transcribe the subtitles from the recent copy to the clearer copy. It should be great, until someone finally gets a hold of the original English dub. THE BACCHANTES DVD : I already have this film (taken from an Italian TV broadcast) and I've been working on a "Fan Dub" when I saw the official DVD was for sale somewhere. They only had one copy left so I purchased the DVD, got it in the mail and ripped it; the image and sound are so much better than the copy from the TV broadcast. Both copies are in Italian only but I do have the English dub of this film and I had almost completed the "Fan Dub" which I have to redo; I'll have to transfer the clearer version I just got to the English dub. DVD also includes a never before seen trailer. HERCULES UNCHAINED DVD - Uncut - I purchased a cheap Italian DVD which has the Italian and English tracks. I already had a widescreen English copy from a German DVD. The image quality from that DVD is stunning but there are 3 minutes cut from it. The new cheapo Italian DVD is uncut but the image quality is not as good and the framing is all wrong (not true 235:1 widescreen but more like 185:1). The audio tracks are identical but slightly less noisy on the Italian DVD. 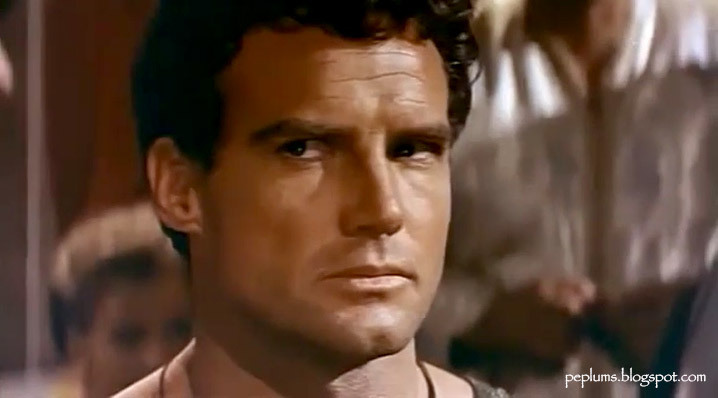 Above is a screenshot of the Italian DVD for HERCULES UNCHAINED. 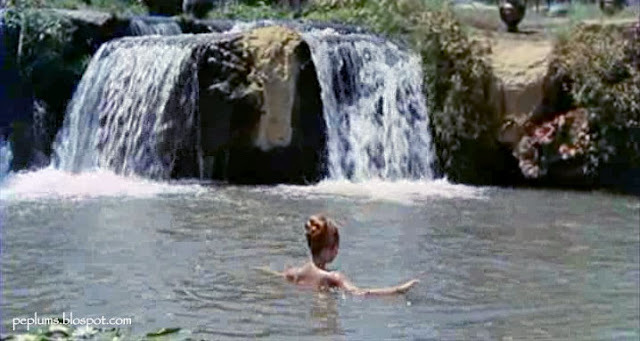 Compare it to the screenshot taken from the German DVD (below). The framing of the German DVD is better and the image is sharper than the soft one from the Italian DVD. The colors are more saturated on the Italian DVD but maybe a bit too saturated. Notice the difference in color of the scarf wrapped around Sylvia Lopez. Which color is the right one? Blue or green?!?! I already watched both copies side by side and took note of where the German copy is cut. 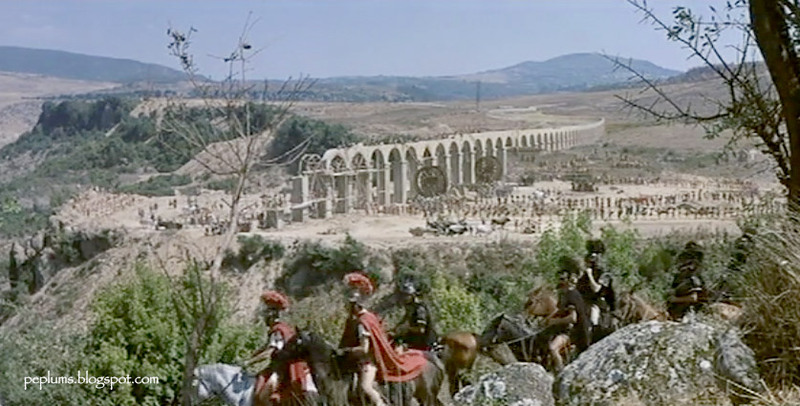 SIEGE OF SYRACUSE DVD - In Italian only - The image quality is stunning. I already have this film but from a murky vhs transfer with subs from an Australian TV broadcast. I'll do a "Fan Sub" of this pristine copy (add the subs from the poor copy to the pristine one). I have to say that the film itself looks amazing. Oddly enough, Tina Louise is not credited on the DVD's cover. Hmm...the other great thing about this DVD is that there's a never before seen trailer included. Yea! 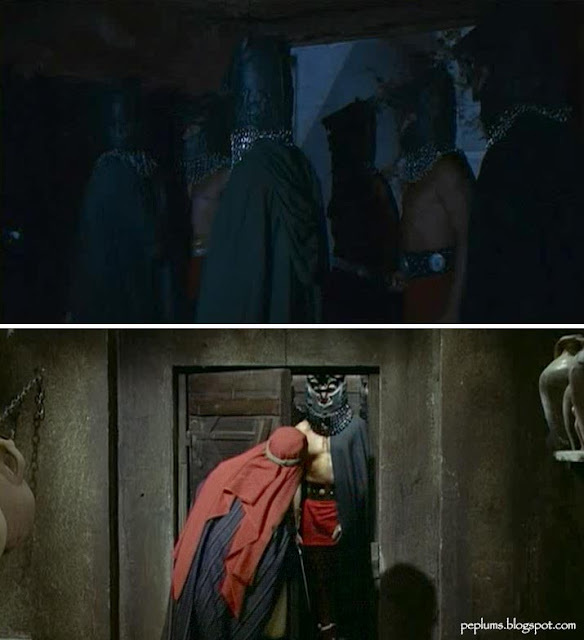 REVENGE OF THE CONQUERED DVD - I purchased the Italian DVD for this rare Swashbuckler and the image quality is STUNNING. The film looks like it was shot yesterday. A true find. I have a copy in English but it's in "super poor near unwatchable" quality. I uploaded a preview of this film years ago at Youtube (see below) and you can see for yourself how bad it is. I'll be doing a "Fan Dub" of this (after I've finished the 3 dozen other films I already have lined up...). 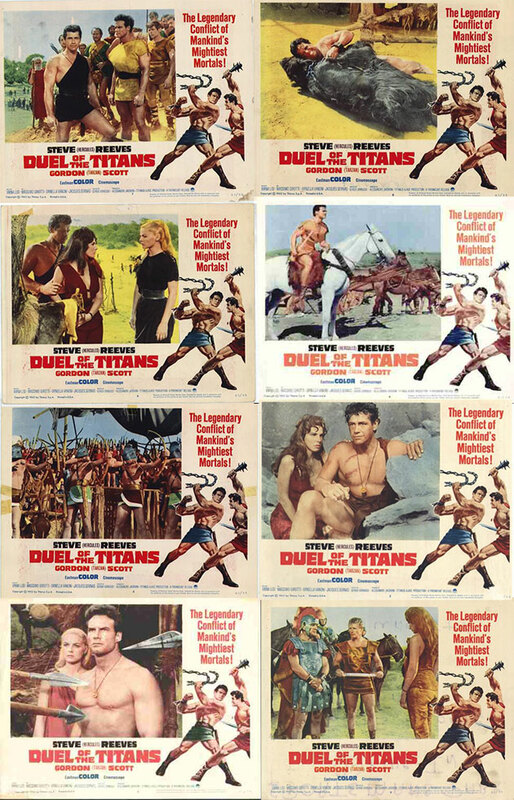 Sorta disappointing lobby card set for DUEL OF THE TITANS. There are many great scenes missing from this set. The spinning torture thingy; the horse run with the fiery obstacles; the wild pagan ceremony at the beginning, etc. Cards #1 and 2 are fine but not that great. Except for card #7 this lobby card set is mostly flat. This was one of the least popular films I've uploaded at my Youtube channels and I never knew why. Maybe it was just the quality of the transfer. Arnaldo and Enzo are almost in every single frame and yet they're at the very bottom of the credits because the cast is populated with so many great PEP stars. Gianna Maria Canale and Massimo Girotti in SPARTARCO (aka SINS OF ROME). One of the best Spartacus films of the bunch. The producers of the Stanley Kubrick production bought the rights to this film in order to keep it out of circulation and out of the public mind while they prepared their own version. Kirk Douglas as SPARTACUS (1960) probably the most famous of all the Spartacus productions. 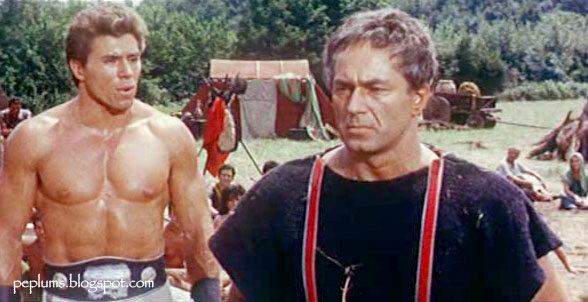 Rocca (Dan Vadis) tries to convince Spartacus (Alfredo Varelli) that he's not the enemy in SPARTACUS & THE TEN GLADIATORS. 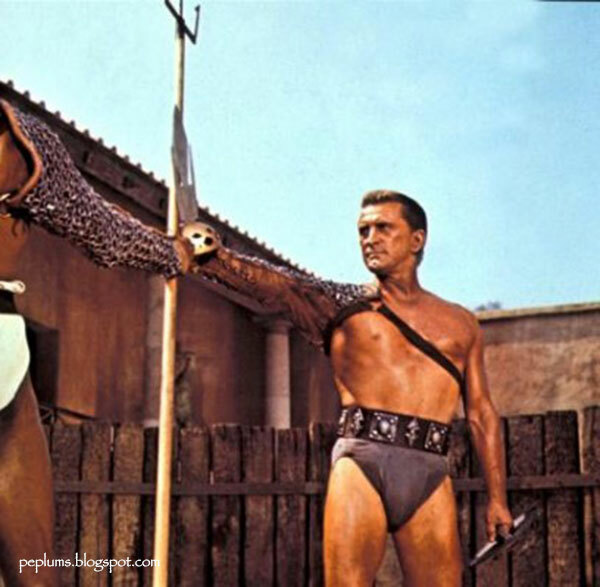 Spartacus has now entered the Pulpy world of action films. 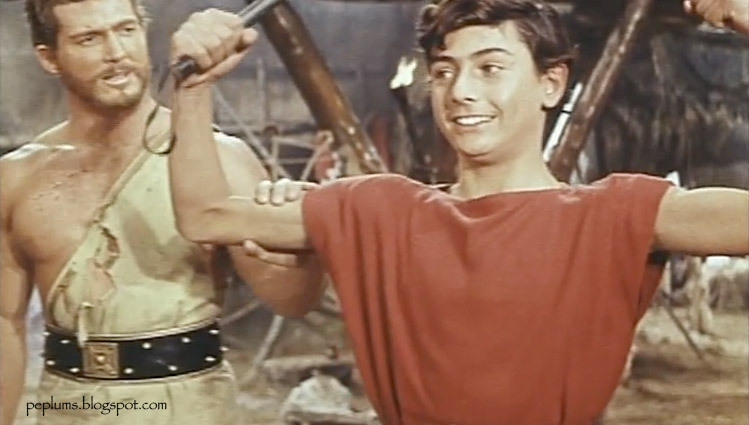 Livio Lorenzon enjoys tormenting Spartacus, played by Peter Lupus, in CHALLENGE OF THE GLADIATOR. Probably the beefiest Spartacus ever. 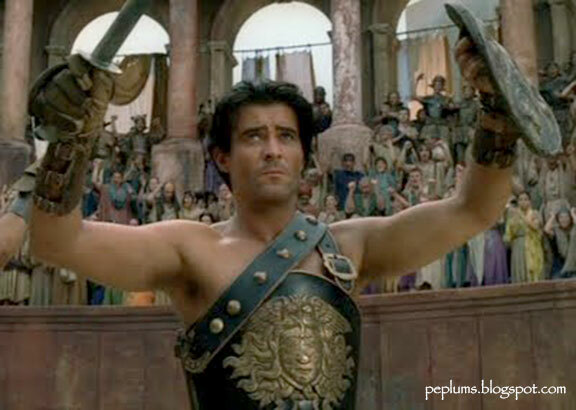 Croatian actor Goran Visnjic played the Thracian rebel Spartacus in a TV mini-series. And last but not least, the late Andy Whitfield was Spartacus for one season (13 episodes) for the TV series SPARTACUS : BLOOD AND SAND before dying of cancer. Liam Mcintyre (below) replaced Andy as Spartacus for one more season. 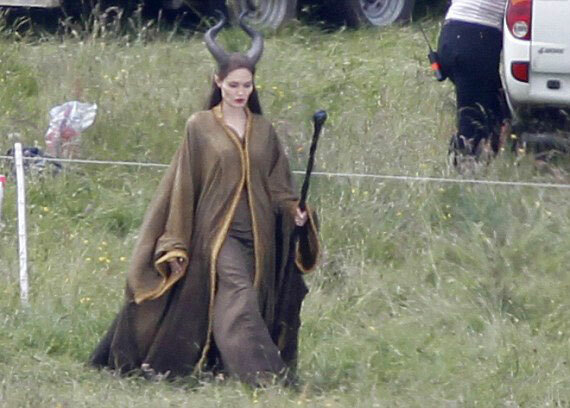 Angelina Jolie is MALEFICENT, which is currently in production. We can see behind-the-scenes action, including an extra smoking a cigarette. The costumes seem somewhat familiar. What is he thinking in this screenshot? 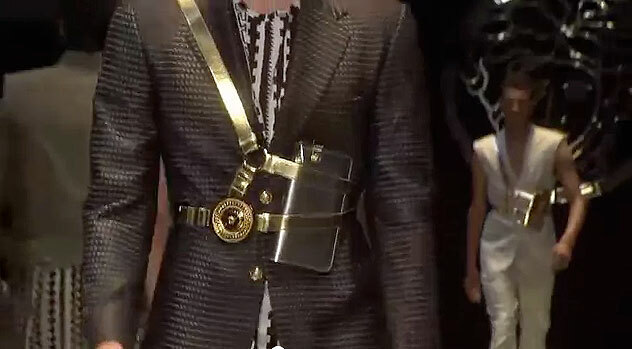 The Versace 2013 Men collection was inspired by the PEPLUM genre. 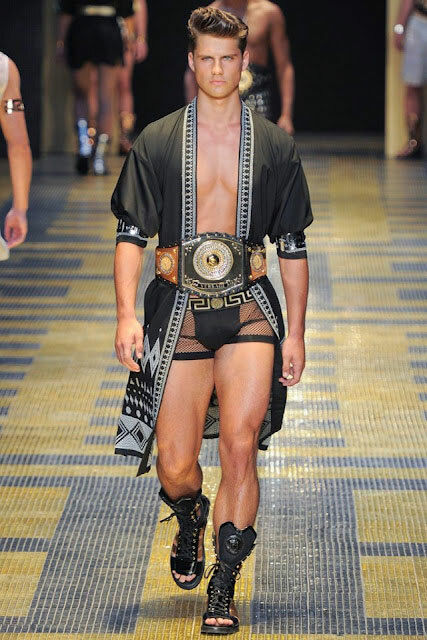 It looks like Hercules' loungewear. 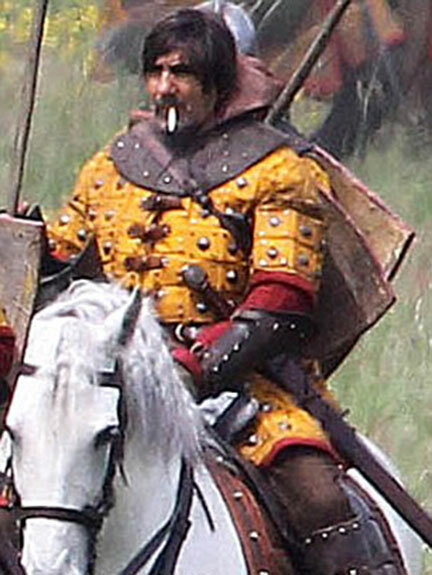 Some of the accessories look like gladiator gear. The sandals are amazing. I want one pair. 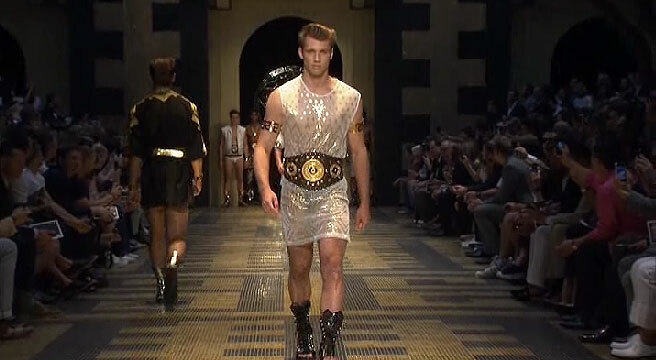 I checked the Versace Women collection and it's more gothic than PEP. If you want to see the collection here's the link. 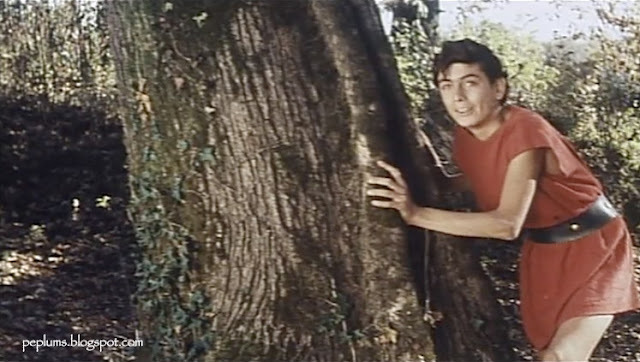 Can you identify the film? 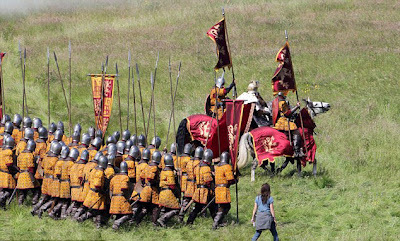 Solid film, with solid cast and above average production values, including great costumes, as seen here. Might be too soapy for some but it's one of those films I can watch over and over again. Trailer for HEROD THE GREAT. Ed chews the scenery and Sylvia is beautiful. While Gloria Milland might be the Queen of "Sneak Up & Stab" (see Thursday's POTD), Kirk is the King of Arrow to the Chest/Pec. Steve is heading outside; you can clearly see it's a painted backdrop in the background but that's not the issue. The painted backdrop shows that it's sorta dark outside but when Steve is outside, it's super sunny. From THE LAST DAYS OF POMPEII. 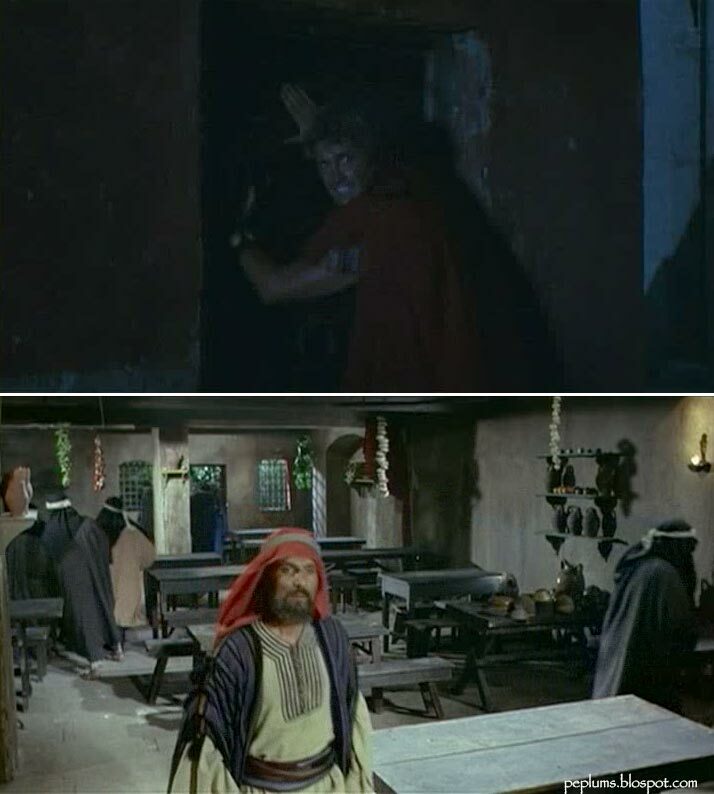 In 7 SLAVES AGAINST THE WORLD Giacomo Rossi-Stuart arrives at a closed tavern or shop, when it's obviously dark outside. But in the next shot, from the interior we see in the background that it's still daytime. You can see sunlight against a column. In 7 SLAVES AGAINST THE WORLD again, Gordon Mitchell and company arrive of tavern/shop. Again it's dark outside but when someone opens the door for them, the men standing outside are brightly lit. According to the bible we all come from these two...so how come I don't look like Jorge? What do you call fans of PEPLUM?